The introduction of classical architecture into the colonial culture was a result of the Renaissance, of the time known historically as the Age of Reason or the Age of Enlightenment. It heralded a spirit of optimism, of confidence and of revolution. The search for rationale and orderliness led the art of architecture to the classic buildings of Greece and Rome. The earliest of the classic styles to be introduced to the New World was the Georgian style, named for the four King Georges of England, who happened to be on the throne during the English Renaissance. One English architect whose name is well worth remembering is Sir Christopher Wren, who introduced the classical themes of Greek and Roman architecture to England and, eventually, to the United States. He was the guiding force in the rebuilding of London following the disastrous fire of 1666. The Georgian style was very formal and rigidly symmetrical. Most buildings had hipped roofs and sashed windows and were built of brick with white trim. Georgian architecture was most popular in the coastal cities of the American colonies and a tour of Annapolis or Williamsburg is an immersion into the Georgian era. The one outstanding example of Georgian architecture in our historic district is at 104 Washington Street. This house has a gabled roof rather than hipped, but the steep pitch is broken by balanced dormers, chimneys at either end, sash windows and a formal and important doorway. Following the American Revolution, building styles moved away from the influence of the mother country, England, and leaned more toward the classicism of Greek and Roman architecture. The era was called the Federal period, in honor of the new nation. Columns were added to facades, with the familiar capitals—Doric, Ionic and Corinthian. New shapes were superimposed on the basic rectangle—ovals and circles and octagons. In general, the impression was of delicacy and beautiful detail. Arched windows were introduced and one of the most popular motifs was the Palladian window, introduced by Italian architect, Andrea Palladio. It featured an arched central window with sidelights. Today, we may call it a Venetian window or Tuscan window, but the design has been happily adapted to many succeeding styles of architecture. Influential architects of the period were the brothers Robert and James Adams of England. The Federal style is frequently labeled Adams because of their outstanding design work. 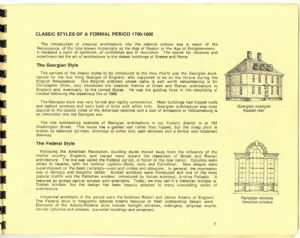 Elements of the Adams/Federal style include fanlight windows, sidelights, elliptical motifs, slender columns and delicate, low-relief moldings and ornament. Illustration: Georgian example hipped roof.